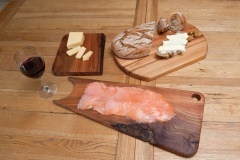 Welcome to Mark and Noel's handmade furniture design website “M&N Design”. All our hand crafted furniture is designed for our clients and handmade in the heart of Yeats own homeland of Sligo, Ireland. 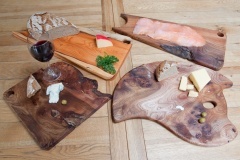 Just as he drew inspirations for his everlasting works so do we, by immortalising native Irish hardwoods by turning them into beautiful once off pieces of furniture, such as kitchen tables, coffee tables, corner units, shelving units, quirky chairs, chaiselounges, mantel pieces, mirrors, etc. 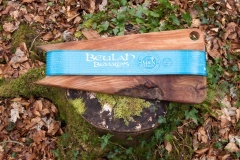 We at M&N Design have been making breadboards and chopping boards for many years now and only launched our "Beulahboards" range encompassing all cutting, serving, chopping and prepping uses! 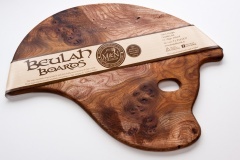 Each one of our boards are named after something synonymous with Sligo and its natural history and surroundings and also very much inspired by the great "WB Yeats" where he and us took much inspiration from our surroundings. 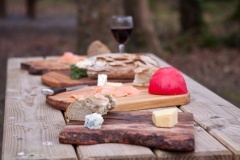 Click here to view M&N Design on RTE Nationwide We scour the countryside for trees from local woodlands and also source wood from neglected & unwanted trees, s uch as elm, yew, beech, oak and cherry. We find that by only using local wood this cuts out the environmental damage caused by transporting or importing exotic timbers. We cater for private and corporate customers, and have supplied feature pieces and furniture to large hotels and pubs in the local area. Click here for information on Yew Trees. 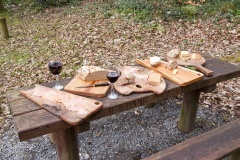 Hall Tables come in solid, Elm, Yew, Spalted Beech or Oak.